The hibiscus flower was created by me using polymer clay cane slices to create each petal. 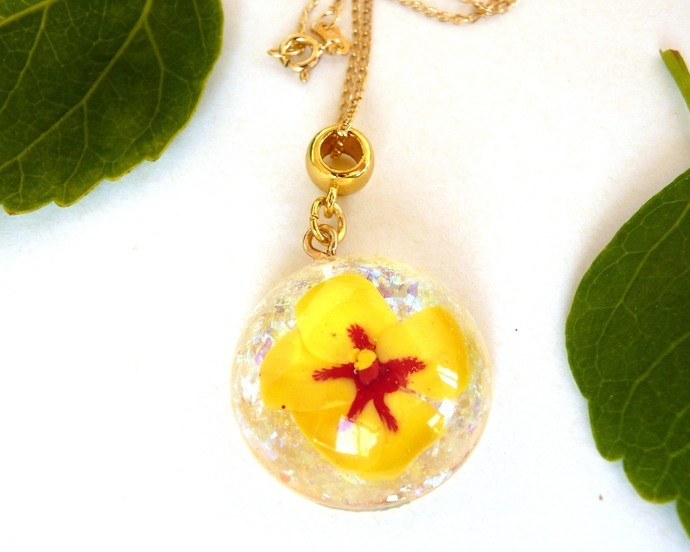 Once assembled and baked the small flower was embedded into resin. The back of the pendant has a fine layer of opalescence to bring out the colour of the flower and to add an extra touch of shimmer. The pendant hangs from a fine triple gold-plated sterling silver chain. IMPORTANT: I make a limited number of each design. Because each piece is individually created there will be slight differences between each necklace. NB: I use a resin with exceptional UV resistance to reduce yellowing and I seal all gold-plated findings to reduce their risk of tarnishing. ❤	CARE – Both polymer clay and resin are strong, but it can be easily scratched or broken if dropped or knocked against hard surfaces. Both can be washed gently in water with soap but do not soak in water for long periods of time and do not expose to long periods of sunlight.